So I lied. I said I would be posting the oldest recipes on the blog first, but I just can’t help myself with this one. I’m just going to post what I feel like posting! These are just to fabulous to hold from the blog and I am so proud of them! My first ever totally Rebecca-made muffins! I rarely bake breads and muffins (except these English Muffin Buns and this Pumpkin Buckwheat Cornbread). I just felt like totally breaking from the ordinary and creating my own baking project without any base recipe to go off of. 100% my own! These will now always and forever hold a special place in my heart and memory since these muffins where the first “meal” I ate post wisdom teeth surgery. I totally nuked them in the microwave, slathered them with PB, and made a big muffiny mash. Even though my mouth and tongue were still numb so I couldn’t exactly taste them, they quelled my growing hunger at least! Plus they were packed with the nutrients I needed since I hadn’t eaten since 7pm the night before as I had to fast for surgery. When I made these, I had them the next day for breakfast, gave my mom one, and she even brought some in to some friends at work. But the rest I froze so I could enjoy them whenever I wanted. (Like after my surgery!). These definitely taste “healthy” so I was worried that I would be the only one who liked them, but apparently they were a hit! Another reason why you can always have your favorite foods like pancakes, granola, muffins, as long as you make them nutrient packed and super healthy! They taste better and you feel good about eating them! I bet by now you just want me to get to the recipe right? Well okay, I will, and I hope you love these little beauties as much as I do! 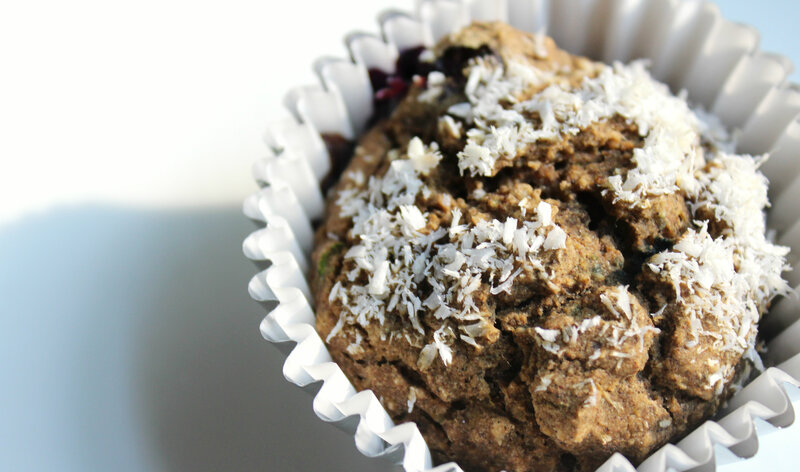 How can you not love a vegan, gluten-free, nutrient packed power muffin that you can fuel your morning with? 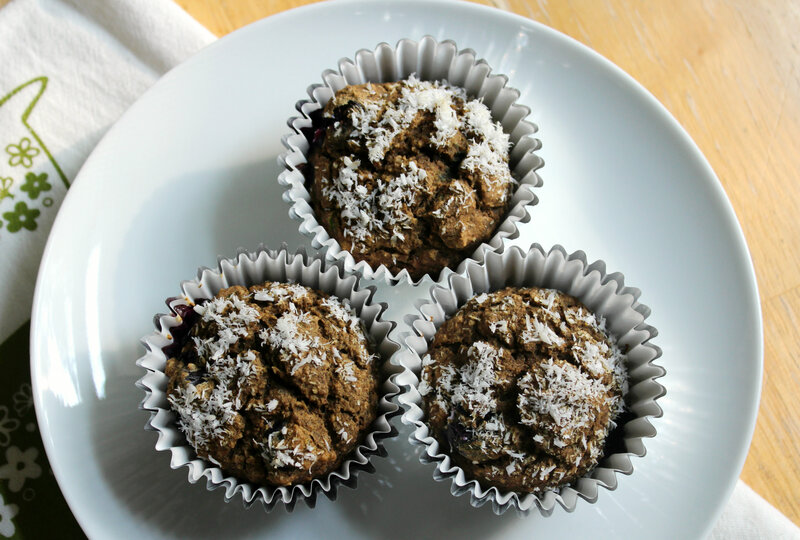 Again, I suggest you serve these muffins nice and warm, slathers with you favorite nut butter or coconut butter! Healthy fats are a must for breakfast, am I right? One more thing. You can make these in whatever muffin pan you want. I used a medium-sized muffin pan, but you can make mini muffins or large jumbo muffins. With my medium pan, I got 10 decent sized muffins. Two was a perfect serving for me if I added globs of nut butter! But you can always have 1 as a quick snack to. These are nutrient dense so they will keep you full and satisfied all morning (or afternoon) long! + In a large mixing bowl combine: flours, stevia, baking soda, baking powder, cinnamon, and flax. Mix well with a wisk. Then add the remaining wet ingredients: extracts, almond milk, banana, zucchini, blueberries, apple cider vinegar. Wisk again so everything in combined and incorporated in to the muffin batter. + Line a muffin pan with muffin papers. Then add about 2 1/2 TB of batter in to each paper. 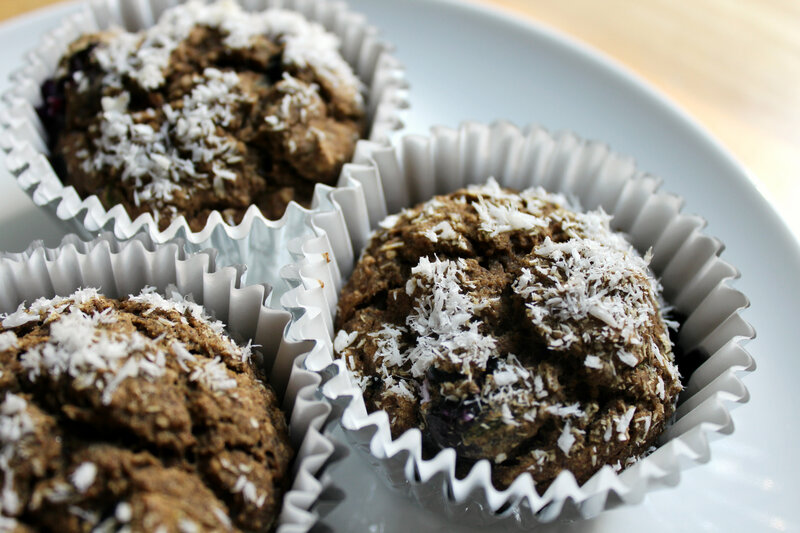 Top each muffin with 1/4 tsp of shredded coconut. + Then place the pan into the oven and bake for 25 minutes. Clean up your bowls and utensils while you enjoy the glorious aroma coming from the oven. + Then remove the muffins from the oven when done and let cool a bit. (I know it will be hard!) Then just dig in! Or you can freeze them for later once they cool completely. Just wrap each muffin in wax paper in their paper cup and place in a plastic baggie. Then just remove and reheat in the microwave when you what them! Yea, you’ve got your power flours, fruits, veggies, flax, everything in these babies! These would be perfect to bake for a brunch with friends or as a quick easy baking gift! or you know…just for yourself since they are really good. I don’t like sharing 😛 And if anyone tells you muffins aren’t healthy or can’t be delicious while being vegan and gluten-free, tell them they are so wrong! Then just bake them these muffins to prove it! Now I leave you drooling with happy muffin thoughts! I hope you give these a try. They are one of my proudest cooking moments as of late! Just typing this up has me craving these! Thankfully I have some still stocked int he freezer 😉 Always have to be prepared and prepared I am! Making homemade yummies like these are so much better and cost-effective than buying processed food in the grocery! 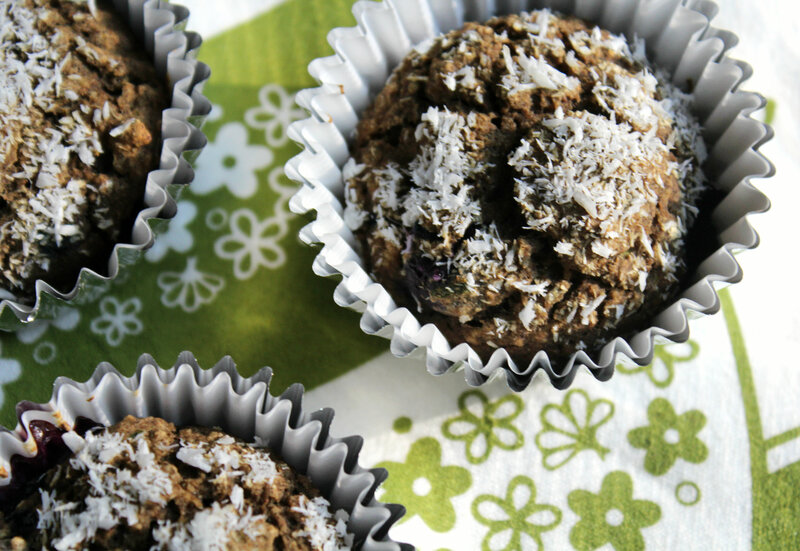 If you want a muffin or granola, make it yourself and you will be so glad you did! + What is your latest baking creation? + When you bake, do you make things as healthy as possible? + What is your favorite type of muffin? Banana flour is so awesome! You can use a little and it acts like you used a lot! One of my favorites! These look sooo good! I definitely have to try these. Whenever I bake I do try to make things as healthy as possible. I try to avoid using wheat flour since it doesn’t agree with me too much, and I try to keep the sugar in check by using things like bananas or applesauce. I’m not very creative though so I always try to follow recipes! Haha, well this is one creative muffin to try then! This looks like an interesting combination for a breakfast muffin- I haven’t tried zucchini WITH bananas, blueberries, etc. I will have to try this out. They certainly look good! I will Pin this for later. Thanks for sharing. Ooooooh, how tasty do these muffins look?! Buckwheat goes in ALL my baking. It really is the best flour out there! 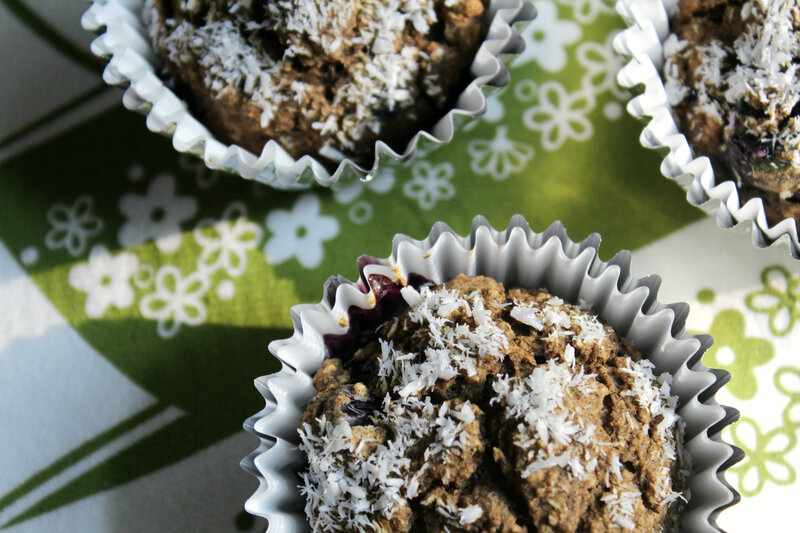 Wow, these muffins are packed with healthy goodness! I have just been looking for a great muffin recipe for my son! He will love these! Banana flour? Who knew? Must try! I’ve never heard of banana flour, where do you buy it. I’ve never seen it at Whole Foods and they have every type of flour. They look good maybe I’ll just substitute. Online! WEDO Gluten Free is the kick starter company that produces it! These sound delish! coming by from SITS! They look delicious! It’s so nice to start the day healthy, and these seem to fit the bill! Thanks for sharing with Pin Your Friday Favorite! I’ve got to say I no longer frown upon baking 😉 It is fun to have fresh healthy breads, muffins, etc! Awesome and thank you love! I will definitely be trying these out! Thank you so much for linking up at Tasty Tuesday! Your recipe has been pinned to the Tasty Tuesday Pinterest board! Please join us again this week! Love this recipe with all the protein, fruits & vegetables. Sounds like a great breakfast that would give you the get up and go to start your day. Thanks for sharing on Real Food Fridays Blog Hop. Will share on Pinterest, Twitter. These look delicious! I know my family will love them. Thanks for sharing. I saw this on the SITS Sharefest. Its pretty common ingredients besides the banana flour (which you can sub)! I love throwing random shizz together and crossing my fingers. Once you have the basics of baking down, it really does work a lot of the time! It does! Once you get over that initial hump you can usually get everything to work out! It’s not different at all! You just use a much smaller amount! The only sweetener I ever use is stevia! These look so good Rebecca! I’ve made sure to save them so that I can make them before school starts and have something yummy to snack on during the day. Can’t wait to try these! Thanks! Yum! 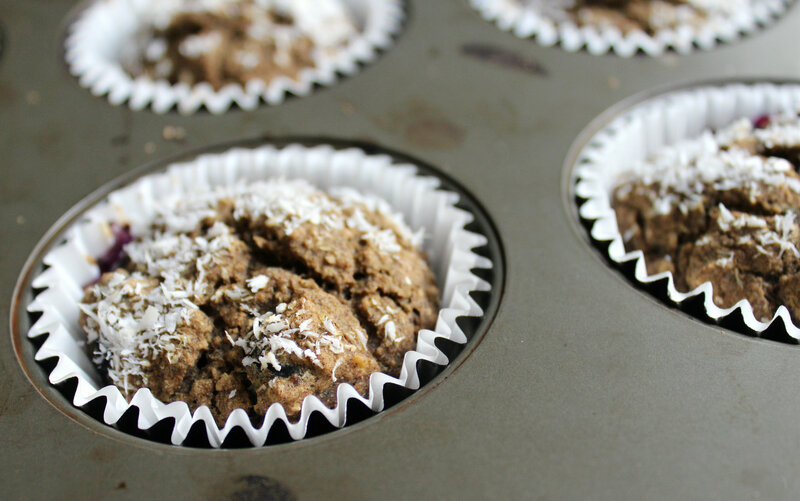 These look so good – I really need to get my hands on some banana flour, sounds intriguing! These look amazing, I really want to find banana flour! I recently tried to make zucchini bread and it is a lot harder than I thought it would be! I think I made it too dense and it didn’t cook all the way through even though I baked it for 85+ minutes! I don’t try to make baking too healthy, I’ll substitute applesauce and bananas for butter and sugar and try to throw in some healthy fats like flax seed or peanut butter. These look really good! I’m pretty sure you should never bake something that long, haha! Cutting out the refined sugar and skipping unhealthy fats is always the best and your good to go! 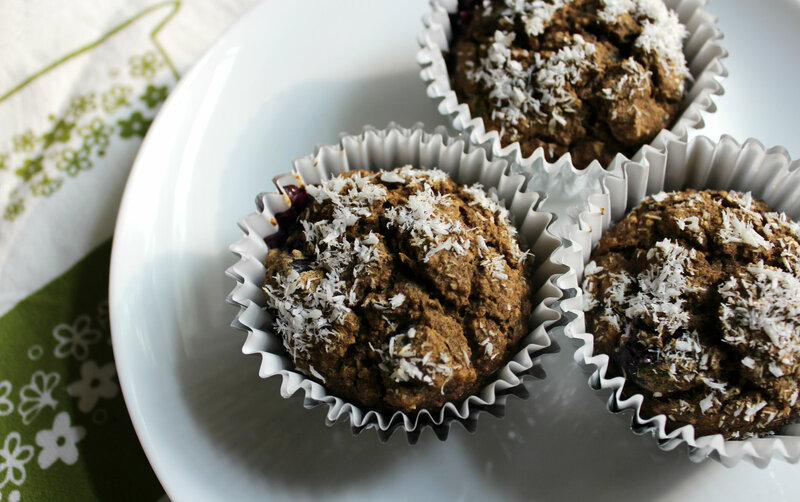 Love all the goodness packed into these muffins! I love muffins, especially for breakfast. Love the healthier ingredients. These look great! I learn something new every day. I had no idea that banana flour existed. I can’t wait to see what you come up with next! These look delicious. I love that you used Stevia to sweeten them. Lol, you sound like me 😉 Granola making is an every week occurrence! Buckwheat is THE BEST flour out there! 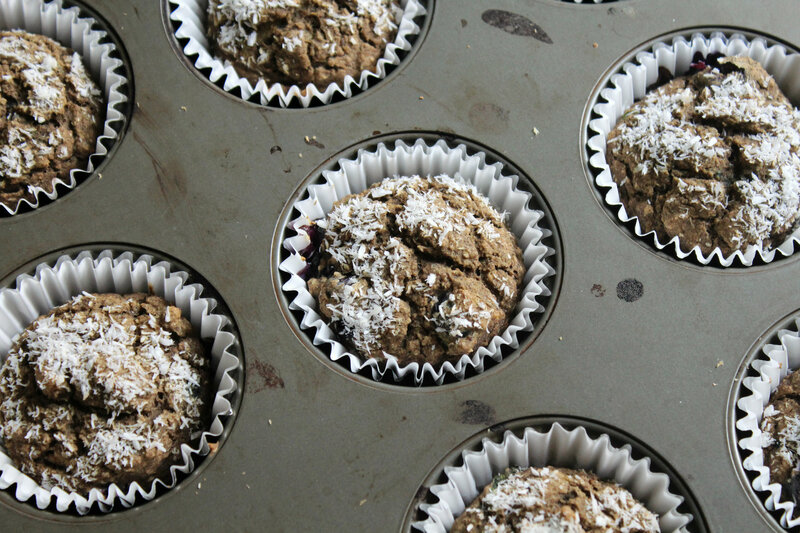 Oh man, if you give me a tray of really good, hearty muffins, they will be gone in no time! Excited to try these babies. They sound awesome! I’ve seen so many great muffin recipes lately! I can always count on you for yummy and GF! Muffins just make people happy 😉 Haha, thanks Jill! How often do you bake? Seems like you have a great new recipe every week! Well if you read the post you would know that I don’t bake often at all! these look like a great way to start your day! i’m OBSESSED with muffins lately! This is like the first time I have eaten muffins in….years? But o man….that is changing! Haha! Yum!!! These would be perfect for my daughters lunch this school year! Totally! They are packed with nutrition, but taste o so good! i’ll eat any of your muffin or breakfast creations! YUM! Wow, that banana flour sounds interesting! It’s so fun! One of my favorites! I need to look into this banana flour!! Love the looks of these! If you find yourself with some extra food fun money…definitely get some! Whoa girl, these are definitely power breakfast! 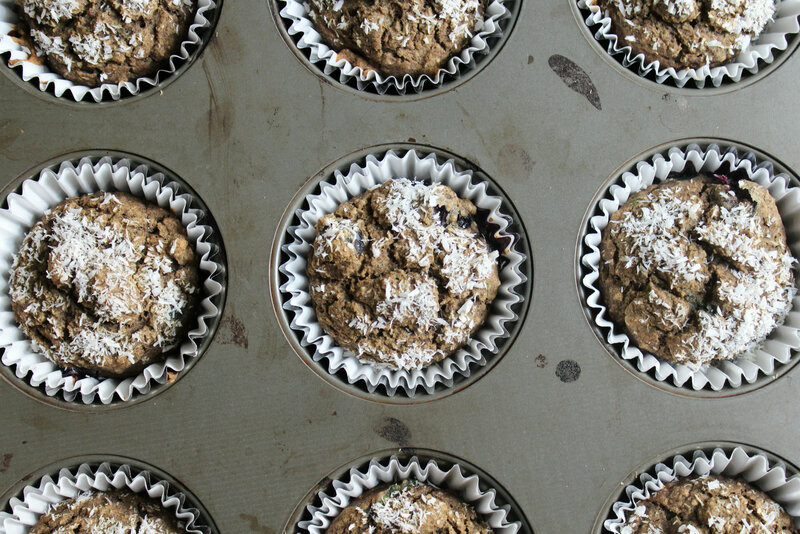 Zucchini, flax, blueberries… Awesome job! hmmmm you may have had me at BOURBON EXTRACT?! These look really good! Looks like a perfect breakfast to start the day! Do you think I could substitute the buckwheat for another flour? Long story but every time I ate buckwheat as a child, I got really sick, so I think I might be allergic to it. Maybe I’d be fine if it was mixed with something though. Pinning and sharing! Yea! You could use more Oat or millet. Brown Rice flour is fine too! 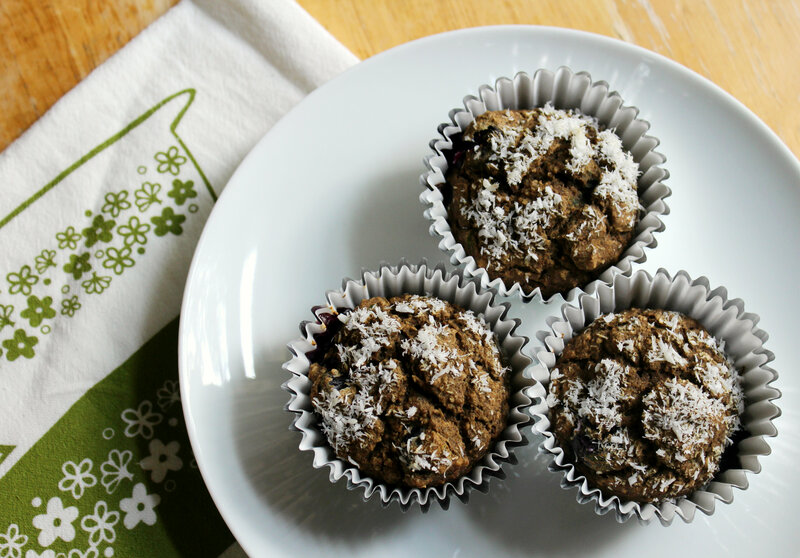 Any time I find a healthy recipe for muffins, it makes my heart swoon! Well done on this being “your own” recipe! The idea of heating them up, putting PB on and mashing them a little bit has made my tummy rumble! haha. I was so worried they wouldn’t come out…but I think I nailed the deliciousness! 😉 Haha!